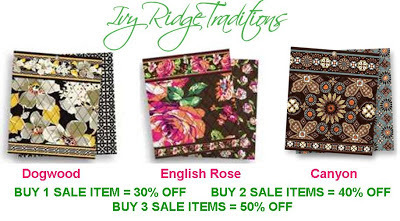 We Now Take ALL Vera Bradley Coupons! 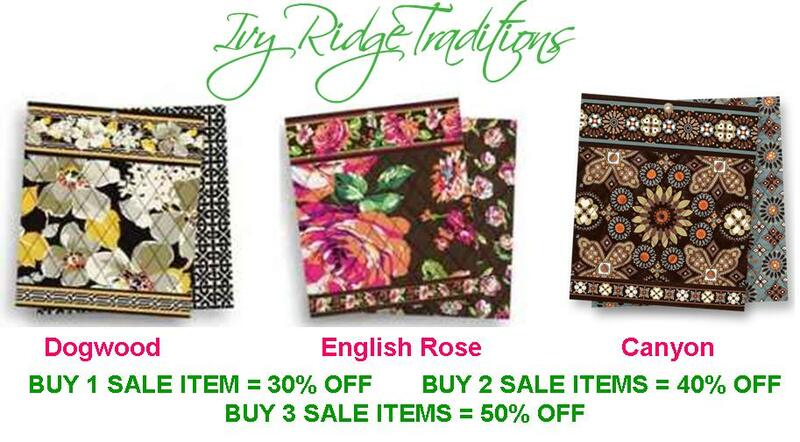 Please share with your friends who love Vera Bradley! We now honor ALL Vera Bradley coupons! 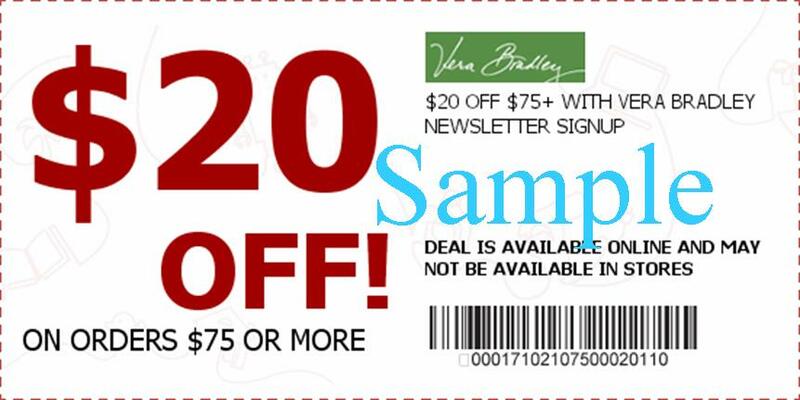 Vera Bradley sends out Birthday Coupons and other coupons through the US Postal Service as well as emails. We are now able to honor their discou...nt coupons at both the North Wilkesboro and Elkin Shop. The best things about using a Vera Bradley coupon at one of our shops is our staff loves to answer any of your questions and help you find the perfect bag. You too can actually see the handbag or wallet in person and NO SHIPPING CHARGES! The Greatest Kitchen Gadget EVER! Huge Shipment of Charles Viancin Silicon Lids! Reusable - Can be used again and again, no more clear wrap! Great gift for the person who has everything. 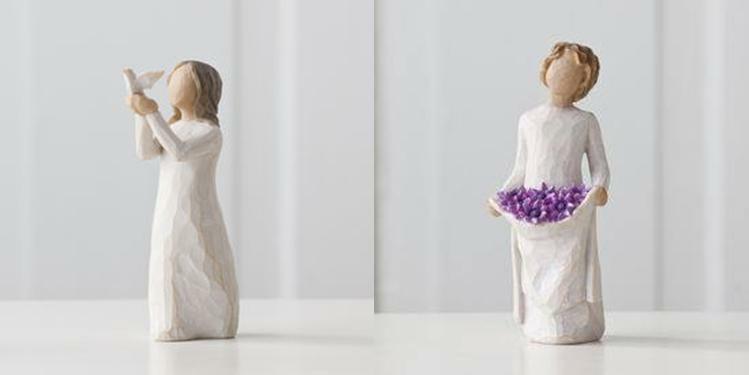 What a bout a set for a wedding gift? The Latest Brighton Summer Promotion! Now through July 7th, receive the S.S. Brighton Tote as your free gift with any same-day purchase of $100 in Brighton. Shop Brighton handbags, jewelry, charms, beads and accessories and receive this free gift as a sincere thank you from Brighton and Ivy Ridge. (Elkin & North Wilkesboro). 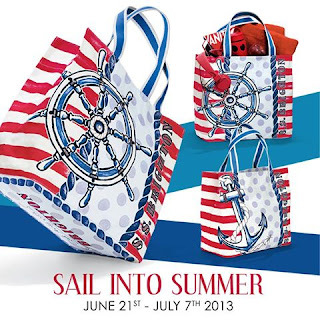 The S.S. Brighton Tote carries a retail value of $100 and features an iconic S.S. Brighton anchor logo on a red white and blue background. Limited to stock on hand. One per customer, while supplies last. More Vera Bradley Retiring Today! 30 to 50% OFF! Try a New Recipe with Me, Plus a New Addition to Your Pantry! I have recently discovered Greek Seasoning! A great pantry staple that I would encourage you to run out now & buy it! Cavender's Greek Seasoning is the most recognized namebrand for Greek seasoning and is a blend of 13 ingredients that are designed to evoke the flavors and aromas of Mediterranean food. You can use it on veggies or as a dry rub on lamb, beef, or chicken directly. Note: it is quite salty and it is very easy to not use too much, so err on the conservative side when using as a dry rub. Here is one of my recipes that I am making for the first time this week and a great to begin using your Greek Seasoning! It is super easy. I am going to make it a little quicker for an after-work meal by using my George Foreman grill. 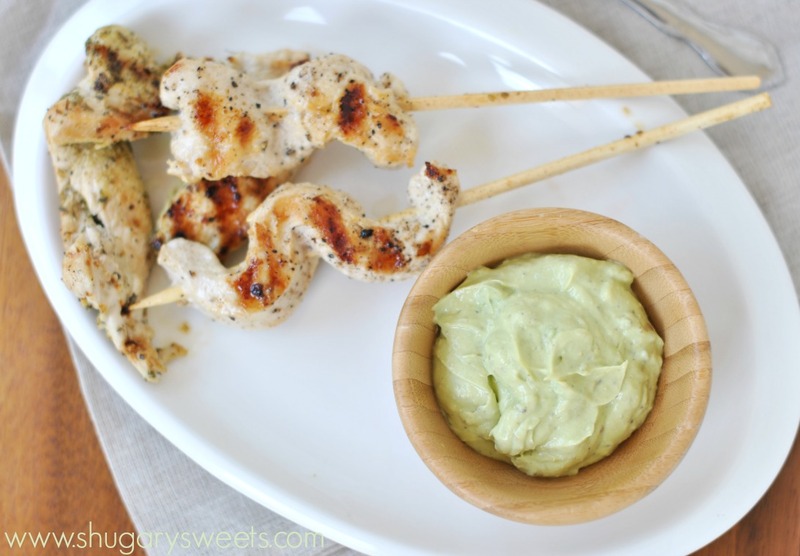 The key to this recipe being wonderful is to make sure you make the Avocado Tzatziki, because without it you just have seasoned grilled chicken which is fine, but not kicked up to "foodie-good" status! 1. In a blender (or food processor), add avocado, Greek yogurt and lemon juice for Tzatziki sauce. Process until smooth. Add remaining sauce ingredients and combine. Pour into a bowl and refrigerate (covered) until ready to eat. 2. For the chicken, slice chicken breasts lengthwise into thin strips. Place in a large Ziploc bag. Add seasonings and shake until evenly coated. 3. Using a bamboo skewer, thread strips of chicken onto skewer. Cook on grill or use a grill pan on the stove top over medium high heat (I am using my George Foremen Grill), brushed with olive oil). Add olive oil and add chicken. Cook about 4 minutes per side, remove when completely cooked. 1. Preheat the oven to 400 degrees. Place the broccoli on a baking sheet that's been lined with foil or parchment paper. 2. In a small bowl combine the honey and mustard until smooth. 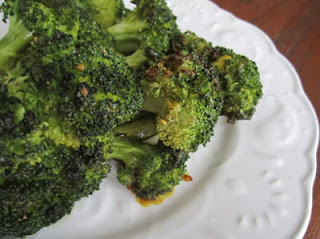 (Drizzle the honey mustard over the broccoli, and also some olive oil. Season with salt and pepper. 3. Roast for 20-25 minutes, or until tender. Note: I will stream my veggies in the microwave with a little water for 5 minutes to speed up the cooking time, then toss in honey mustard mixture until put in the preheated oven until they brown a little. 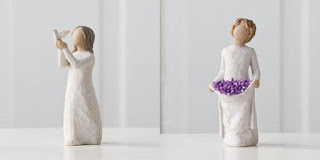 Now in-stock: Soar (a time to reflect; a time to soar) and Simply Joy (You're simply a joy in my life) at both our Elkin and North Wilkesboro shops. New Pandora Bangle & New Summer Charms! The Pandora Bangle Has Arrived! Add clips, charms and pendants and give way to new stories, creations and combinations! Perfect for stacking with your current Pandora clasp or leather bracelets - you can even stack multiple bangles together for a stylish look that is all your own. All are currently in stock! The instructions are laid out here for an adult – please supervise kids as necessary. 1. Get some red cabbage and chop it up into small pieces. 2. Put the chopped cabbage in a pot and cover it with water. Boil for 10 -15 minutes (or until the water becomes well coloured with cabbage juice). 3. Strain off the cabbage juice into a flat dish and let cool for at least an hour. 4. Get some blotting paper or thick watercolour paper (ideally acid-free) and soak in the cabbage juice. Once fully soaked, take it out and leave to dry completely. 5. Now its time to EXPERIMENT! 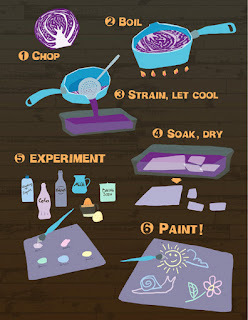 Take some smaller pieces of the cabbage juice-stained paper and brush on different household solutions. Some interesting ones to try are vinegar, cola, baking soda (that’s been dissolved, of course), milk, washing up liquid, laundry liquid, toothpaste, lemon juice, other fruit juices, and anything else that you think might be interesting – just remember to rinse your brush between using different solutions. Older kids might want to try household ammonia, dissolved aspirin and antacids (under adult supervision). Use a pencil to write down under your experiments what solution caused what colour change. 6. 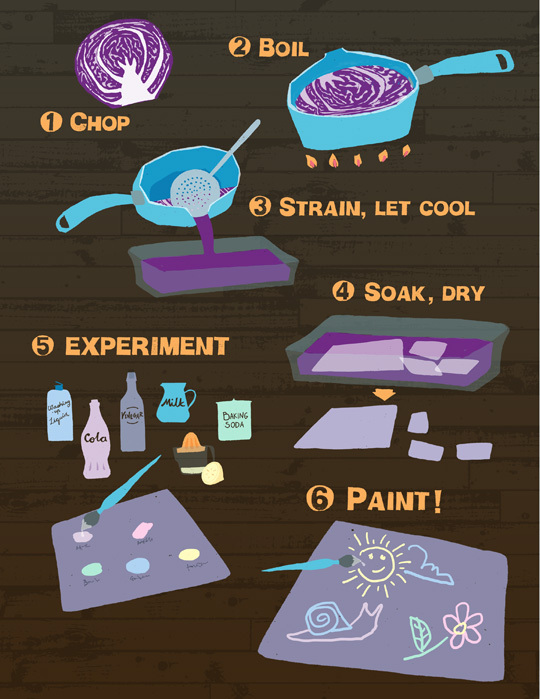 With the colour-change knowledge from your experimental stage, paint a red cabbage pH-indicator picture! Red cabbage contains a water-soluble pigment called flavin which is an anthocyanin. Anthocynins can also be found in apple skins, grapes, poppies and plums; and it changes colour with the pH (or acidity/basicity) of the solution it is in. Very acidic solutions turn it a deep red; neutral solutions make it a purple-ish shade; and basic solutions turn it a greenish-yellow. In this experiment, you are using red cabbage juice as a pH-indicator to find out whether the household solutions you are testing are acidic, basic, or neutral. Free Monogramming on Select Vera Bradley Items! 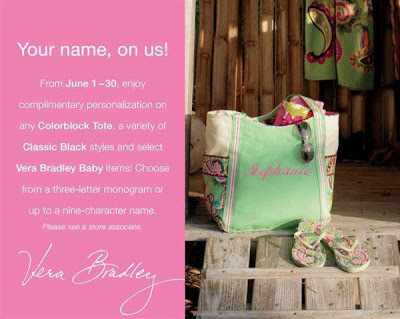 Starting June 1st through June 29th receive FREE Vera Bradley monogramming. Styles available for personalization include the Colorblock Totes and select Classic Black styles.